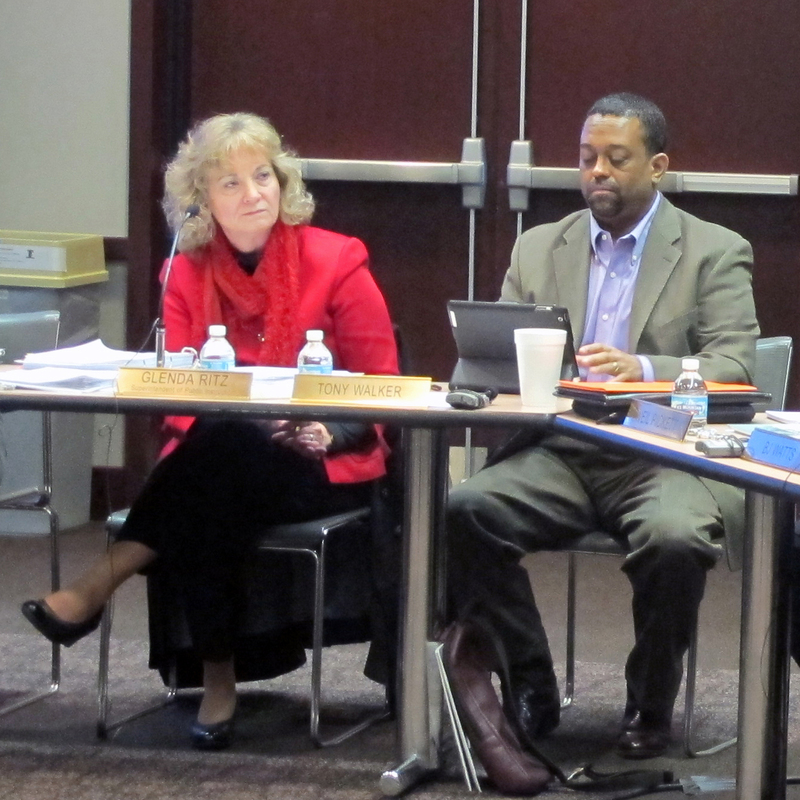 The State Board of Education listens to public testimony in October. 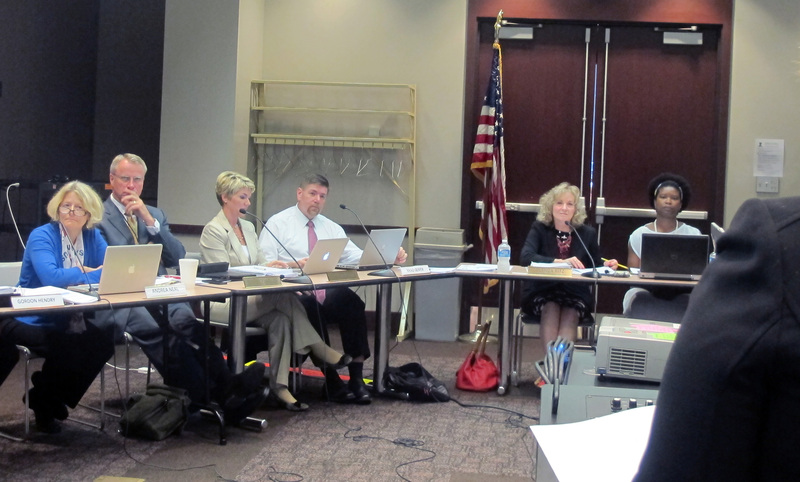 The 10 appointed members of the board have asked the Indiana Legislative Services Agency to take over calculation of the 2012-13 school letter grades from the Department of Education. The State Board of Education wants the Indiana General Assembly in charge of the 2012-13 school letter grades, not the Department of Education. In a letter to Speaker of the House Brian Bosma and Senate President Pro Tem David Long, the board members requested that the state’s legislative services agency run the A-F school ratings, a request the Republican leaders granted. “The State Board of Education says we are dragging our feet, but we can’t do calculations if we don’t have the data,” IDOE spokesman David Galvin tells StateImpact. Galvin says the department is still waiting for testing company CTB/McGraw-Hill to rescore some ISTEP+ exams, which won’t be done until Nov. 5. He says it will take about two to three weeks to run quality control measures, and grades should be done around Thanksgiving. She said she wasn’t aware of any information for which the department is waiting and even if a few scores are changed, calculations can be changed later. “To me, that sounds like an excuse to delay the release of the scores,” she said. Last year, the first year the current A-F grading scale was used, schools got their ratings in mid-September and had several weeks to appeal. The State Board released the 2011-12 grades Oct. 31. Indiana uses scores on state standardized tests to assign the letter grades to schools. But this year computer glitches that halted the administration of spring ISTEP+ exams also delayed the reporting of scores to schools. 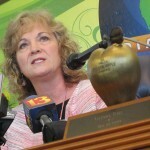 It’s not the first time State Superintendent Glenda Ritz, a Democrat, has found herself at odds with the rest of the board. Though Ritz is elected, the other 10 members were appointed by governors Mitch Daniels and Mike Pence. By law, both Democrats and Republicans must serve on the board. Earlier this month tensions were apparent when Ritz, as chairman, would not allow the board to take agenda items out-of-order. At the time, she said she feels the board owes it to the public to stick to the posted agenda. Ritz is currently out of the country on an educational trip to China. Galvin says the superintendent received the State Board’s request via email around 9 p.m. Thursday night. No one else from her staff was copied on the email. Until recently, the State Board was under the umbrella of the IDOE. But Pence transferred oversight of the board to the Center for Education & Career Innovation when he created the new agency this summer.